A blanket of white on a frozen river! 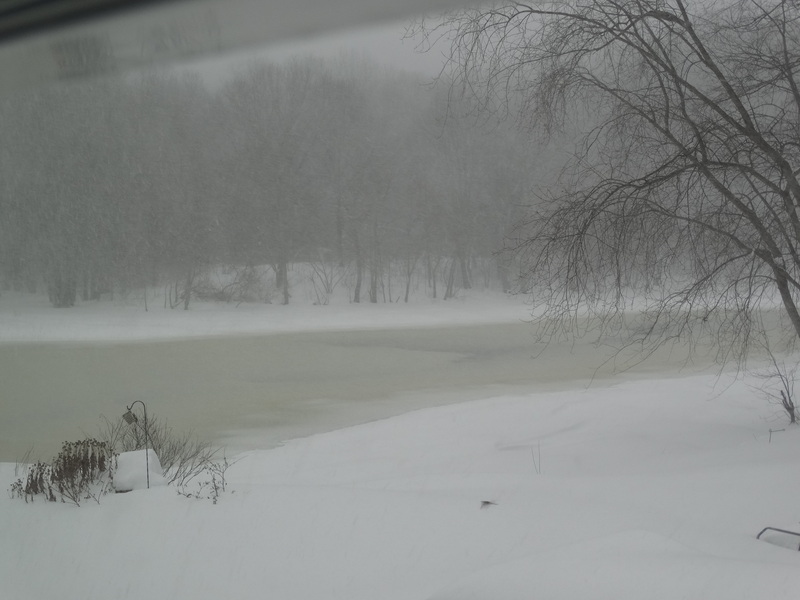 Blizzard Juno is here and giving the Concord River (and surrounding areas) a deep coating of pristine snow. Chris’ car is mostly buried and Penny has decided it’s best to pee in her diaper than head outdoors. That’s okay, I have a new pack of diapers that will get her through these next two days. The birds are doing their best to eat while the snow and wind whips at them. All the suet feeders got filled yesterday, in anticipation of Juno. It’s my hope the food lasts until the storm has passed. Like Penny, I am not relishing going out just yet. Carolina wrens at the feeder outside my bedroom window. Cleo, watching the wrens, no doubt hoping for a frozen, tasty treat. 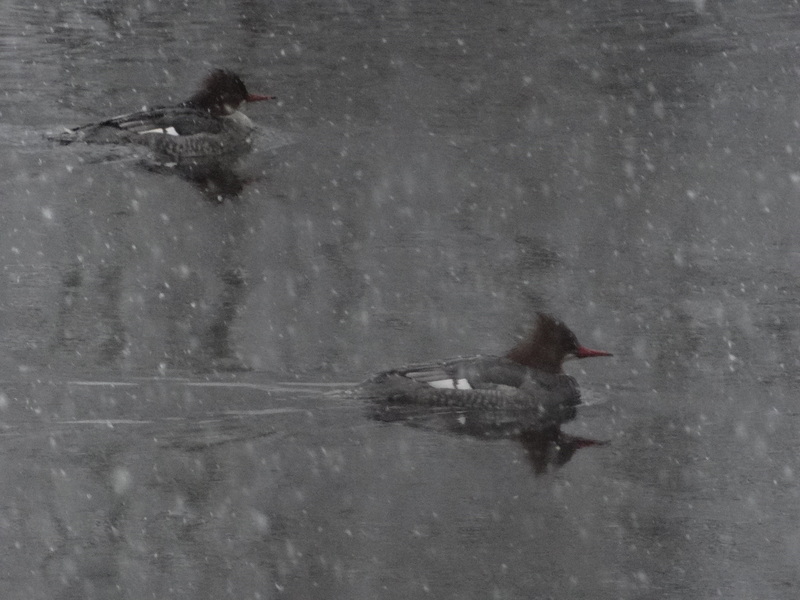 A pair of common merganser hens are braving Juno, but the Mallards are MIA. 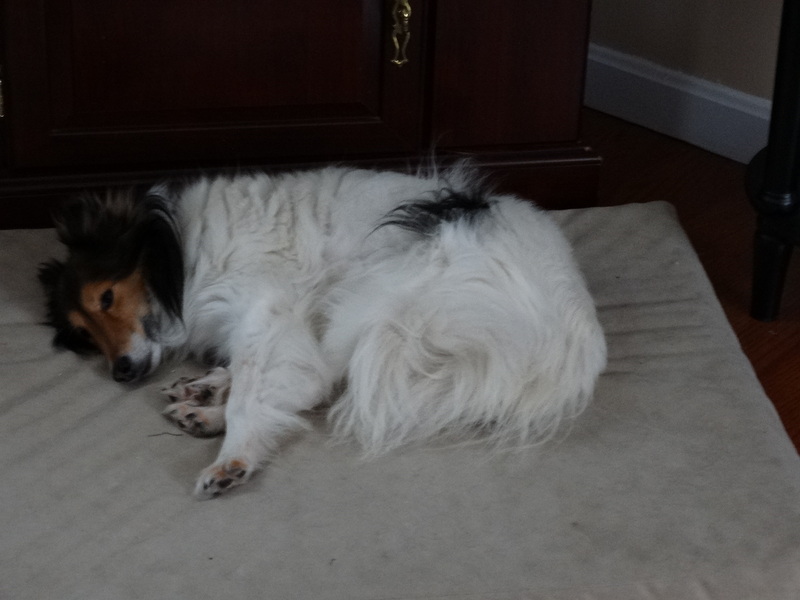 Sparky would be outside with me whenever I shoveled or snowblowed, barking at the snowblower. 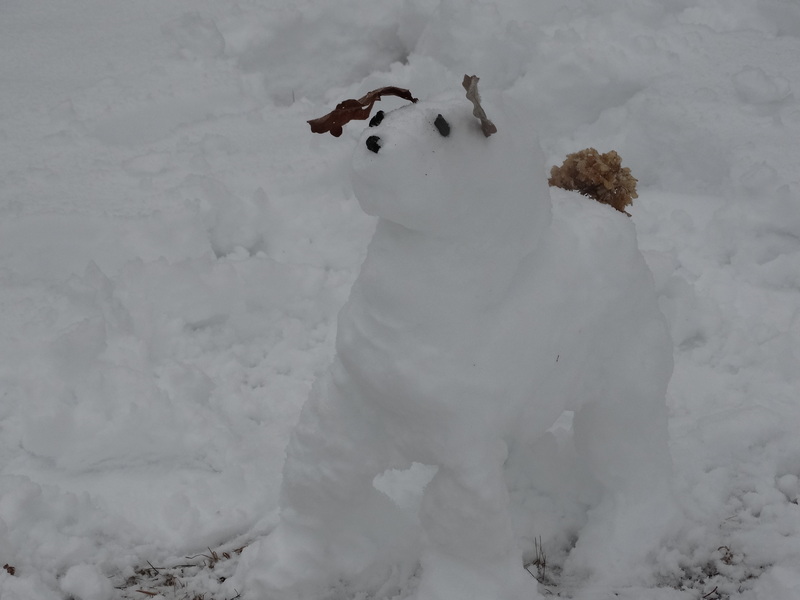 He loved to catch snowballs and roll in the snow, creating a dog’s image of a snow angel. I wasn’t alone, however. 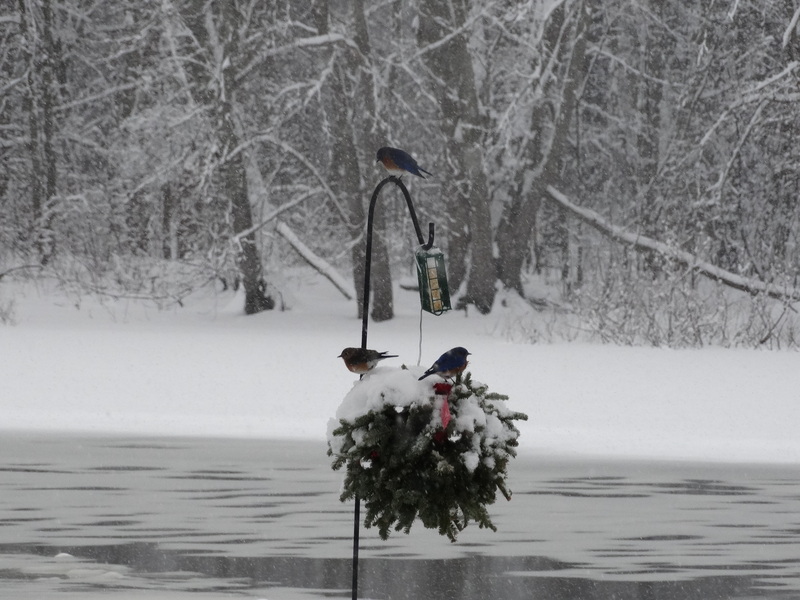 The snowfall blessed me with a flock of bluebirds. Their sweet calls added the perfect soundtrack to what could have been a melancholy activity. Juno is still roaring outside, the bluebirds are still here, and I have a snowday (no school today!). Safe and tucked in our warm home I send blessings to all of you in hopes that you, too, are safe. Penny, enjoying the good life. Gallery | This entry was posted in Life on the Concord River and tagged blizzard Juno, blizzard of 2015, blog about birds, blog about dogs, blog about ducks, blog about living on a river, blog about losing a pet, blog about wildlife, Carolina wrens, common mergansers, concord river, Concord River Lady, Eastern Bluebirds, life on a river, life on the concord river, living on the Concord River, River Lady, riverlady, single woman living on a river, snow on the Concord River, stories about living on a river, stories about living on the Concord River, storm Juno, winter blizzard Juno, winter storm Juno, winter storm of 2015. Bookmark the permalink. 4 Responses to A blanket of white on a frozen river! Thanks so much for the virtual tour. It really makes me happy that the house is in good hands. The river is spectacular as ever, and I know you have the prettiest yard and view on the Concord. It ‘s like living on a houseboat . It was a sad time for me when I left and I didn’t think I could bear to see it again, but its really been a joy to see. Don’t ever leave, you will regret it.! On the bright side , it is Spring here in Florida, and the grass is green…no buffleheads or mergansers in sight, but there are sandhill cranes wandering around the pasture taunting the dogs. .
Beautiful here also! We can see the snow on Arlington center from our apartment and a few a lovely church steeple covered in snow the church bells are ringing. A cleansing blanket so we may begin fresh. Hi Sparks!